Galil Motion Control, an industry leader in motion control technology, is announcing the latest product in their RIO Pocket PLC Series. 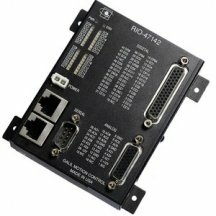 The new RIO-47142 includes an internal switch with two Ethernet ports for daisy-chaining multiple RIO units. This allows management of an unlimited number of inputs and outputs without an external Ethernet switch. Each RIO unit is self-contained and provides 32 optically isolated digital inputs and outputs, and 16 analog inputs and outputs. RIOs are intelligent input and output controllers that use a powerful RISC processor for fast handling of I/O & logic. There is on-board non-volatile memory and multitasking for simultaneous execution of up to four programs. Other standard features include variables and arrays, PID process control loops, timers, counters, web interface, email alerts, data-logging, and the ability to read position and temperature sensors. The RIO controller can be programmed using Galil’s easy-to-use, two-letter language which is standard for all Galil motion and I/O controllers. Software is also available for converting a Relay Ladder Logic program (often used by PLC programmers) into code for input into the RIO controller. Measuring just 3.88” x 4.26” x 1.30”, the compact RIO is packaged in a metal enclosure and provides D-type connectors for convenient interface. The RIO receives power from an external supply of 18V – 36V DC. LED indicators provide a convenient display of all digital inputs and outputs. The RIO-47142 is $415 US in single quantity and $305 US in quantities of 100. Delivery is <2 weeks.